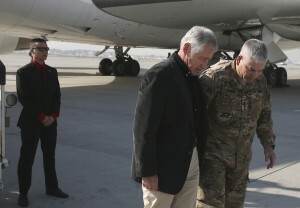 WASHINGTON — The top American commander in Afghanistan told lawmakers on Tuesday that the war is not a lost cause and underscored his optimism with a personal story about his son, an Army sergeant preparing for his third deployment to the war-torn country. In sobering testimony before the House Armed Services Committee, Army Gen. John F. Campbell said the last time he saw John Jr. was in August 2014 in Jalalabad, a city near the Pakistan border. He spoke to him a few days ago. “If I thought it wasn’t worth it, I’d tell my own son, ‘You need to do something different,'” Campbell said. Afghanistan is at turning point and the coming year may be no better, and possibly worse, than the last unless the fragile government in Kabul holds firm and the nation’s security forces improve, Campbell said. He urged skeptical lawmakers to keep backing the U.S. mission in Afghanistan, now entering its 15th year. Campbell’s testimony comes as lawmakers are growing skeptical amid concerns that worsening security conditions demand a greater number of U.S. forces. But there is also ample frustration that the finish line still is not visible for a war that began in 2001. “How many $4.1 billion times are we going to do this before we can figure out that we can get out?” asked Rep. Loretta Sanchez, D-Calif., referring to the amount the U.S. committed in 2015 to support the Afghan security forces. Since 2002, the U.S. has allotted nearly $64 billion to build up the country’s army and police. Rep. Walter Jones, R-N.C., seconded Sanchez’s frustration. The American people are “sick and tired,” Jones said, of being perpetually told that progress is being made in Afghanistan. Yet the war continues. “This has just got to come to an end,” Jones said. Campbell estimated it will be 2024 before the Afghan economy generates enough revenue to make the country self-sufficient. “Ultimately, Afghanistan has not achieved an enduring level of security and stability that justifies a reduction in our support in 2016,” Campbell said. Most of the problems facing the Afghan security forces stem from poor leadership, Campbell said. The Afghan army has replaced 92 general officers, including a high-level commander in volatile Helmand province. More needs to be done to make sure the Afghan forces are helmed by capable officers, according to Campbell. “This kind of change takes time,” he said. Campbell is expected to retire soon and Obama has nominated Army Lt. Gen. John Nicholson, Jr., to replace him. Republicans have long assailed Obama’s exit strategy, arguing that conditions on the ground in Afghanistan, not a calendar, should determine the pace of the withdrawal. With the Taliban staging new offensives and the Islamic State extremist group seeking a presence in Afghanistan, congressional Democrats also are confronting the prospect of an extended stay. Rep. Mac Thornberry, R-Texas, the committee’s chairman, noted that the reductions in U.S. force levels have reduced the ability to collect intelligence on looming threats. “It is harder to keep up with the enemy and prevent another attack on our homeland,” Thornberry said. He said he is concerned Campbell does not have the resources and authority he needs. Campbell said Islamic State militants continue to “conduct brutal attacks against civilians, and directly compete with the Taliban for resources to establish a foothold in the country.” But he said U.S. forces have had considerable success in “degrading their capabilities” and blunting their growth. While campaigning for his second term, Obama promised the war in Afghanistan would end on his watch. At the end of 2014, the White House declared an end to combat operations there. Yet American forces and money remain committed as Afghan troops and police slowly take over the fighting. The mission of the U.S. troops in Afghanistan is to conduct counterterrorism operations and to train and assist the Afghan security forces. Nicholson assured the Senate Armed Services Committee during his confirmation hearing last week that he would do a thorough review to make sure there are enough American forces to accomplish both assignments. Overall, the U.S. has committed $113 billion since 2002 for reconstruction projects in Afghanistan in hopes of establishing a stable, functioning government in Kabul. Yet Afghanistan still lacks the capacity to independently operate and maintain the hospitals, roads, power plants, and more built with all the money.